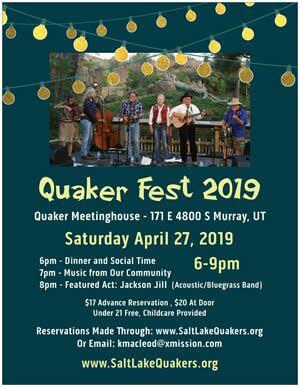 It's time for the Salt Lake Monthly Meeting's Quaker Fest 2019, held at the Quaker Meetinghouse, 171 E 4800 S, Murray, UT.Saturday April 27, 6-9pm$17 - Advance, $20 -At Door, Under 21 FreeThis year the event features a bluegrass band - Jackson Jill. There will also be dinner, and some entertainment from the meeting's community. 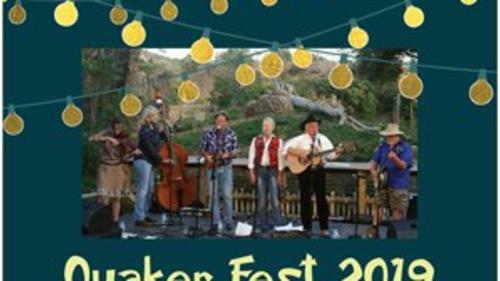 This event supports the meetings continued care and renovations of the historic Murray church building purchased by the Quaker meeting. This is the only Quaker Meetinghouse in the state of Utah.